Well I love Juicing! 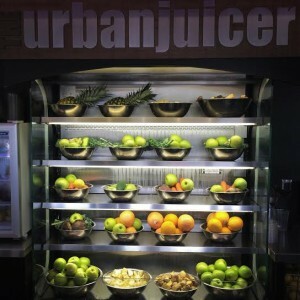 I like cold pressed juices, made to order juices, smoothies, and fresh blended juice bowls! I really believe that the best way to add juices into your life is to start with one a day. Trade out your mid-day snack for a fortified juice. Or, choose a very light healthy meal like a couple of eggs, a side salad, or handful of trail mix, and compliment with a nutrient rich smoothie for your meal substitution. On Monday mornings I like to start my week off with a Kind bar (For more on bars refer to THIS POST) and a green juice. Between lunch and dinner I may have another juice full of carrots and beets. I can totally feel it energizing and revamping my body. I’m not a huge proponent of juice cleanses lasting over a few days. Remember moderation? There is a purpose for solid foods also! Many of my clients don’t understand why buying juice off the shelf at Harris Teeter is any different than going to a local juice bar. Well, I’m going to give you the lowdown. There are a wide variety of juices in grocery stores. Some are definitely better than others. So if you are going to continue to buy in a grocery store, look out for the really bad, sugar laden, chemical crap! Don’t buy it! My advice to you is to avoid the grocery store and buy the good quality stuff every time. It may not last in your refrigerator as long, and may cost you a little more, but your body will thank you! Take a look at some juice terms defined! “Juices from fruit concentrates”- Do not contain the whole fruits and they may be nothing more than sugar water — possibly made with chemicals in water from industrial sites. “100% juice”- Everything in the bottle came from fruits or vegetables. It doesn’t necessarily mean that your apple juice is made from all apples; it could have other fruit and vegetables added to help the flavor. These terms don’t define how the juice is processed or preserved. 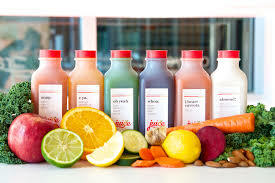 “Pasteurized juice”- Most grocery store juices are pasteurized meaning they use heat to treat the juice. 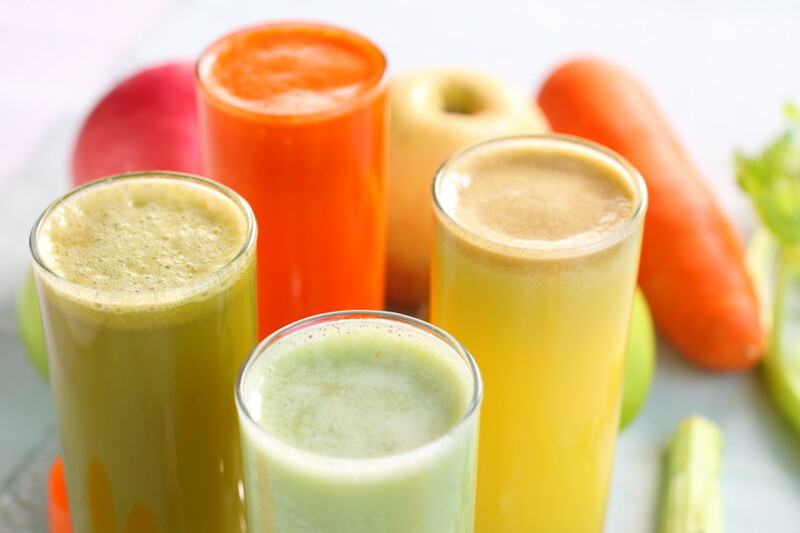 The heat will kill some bacteria allowing juices to have a longer shelf life. Pasteurizing juices also kills a huge amount of the nutrients in juice, making it not nearly as beneficial to your health. “Flavor Packs”- Because of the loss of taste and color in the heating process called pasteurization, companies such as Minute Made, Simply Orange, Tropicana, and Florida Natural have added “flavor packs” which are mixed back into the juice after storage to restore flavor, and pulp-dissolving enzymes. These packs are added to make the juice TASTE fresh. It actually is not fresh at all! “Unpasteurized”- often called “fresh juice” has not been treated. It retains the MOST amounts of nutrients! “Raw juice” This is unpasteurized made with only raw ingredients. “Cold-pressed” The juice is squeezed from fruit or vegetable using a slow, masticating juicer with no blade. Because cold press juicing is so precise with its process of extraction, there is minimal air and heat so very little oxidation occurs. 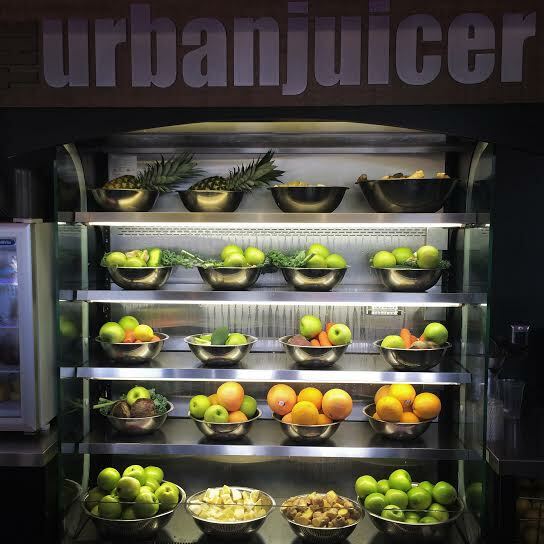 This means you can enjoy our cold pressed juice up to 3 days after extraction! 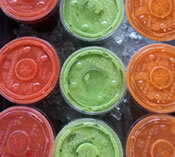 “ Fresh juices & smoothies” Juices and smoothies using a blender or centrifugal juicer with a blade. Most retain pulp (which means fiber) which is good for digestion! They may have been exposed to small amounts of oxidation and lose a tiny bit of nutrients but are still fresh and awesome. You should drink immediately. 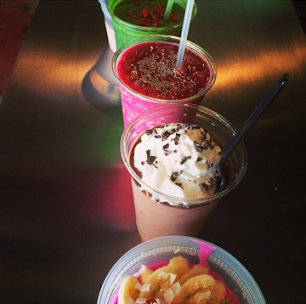 Make sure your smoothie bar uses fresh ingredients. Some use only organics also! Juice Revolution: All sorts of blended concoctions- Smoothies and Frozen fruit bowls and Vegan Milkshakes galore!